Looking for a simple yet beautiful necklace pendant that can be worn any time with any outfit, without having to worry if it fits or is too overpowering? If so then this is the pendant for you! 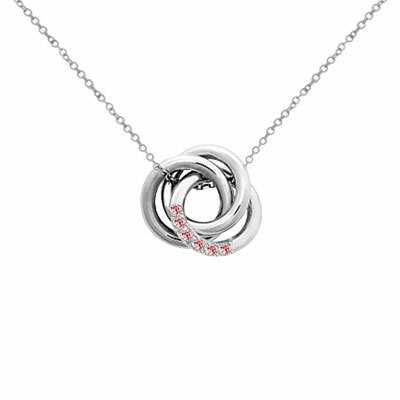 The small size holds several gemstones set into the sterling silver love knot. It is design so it looks great from any angle and hangs well on a simple silver chain necklace. While it is true that rings are among the most commonly bought pieces of jewelry, that does not mean you have to settle for anything less than the best. Apples of Gold has many fine sterling silver pieces, but one of the most popular is this Love Knot Pendant Necklace with CZ Stones. We guarantee our Custom Love Knot Pendant Necklace with CZ Stones in Sterling Silver to be high quality, authentic jewelry, as described above.